Udhagamandalam better known as Ooty is the most popular hill station in South India.Ooty located in the Western Ghats at a height of 2240 m. Udhagamandalam is the headquarters of the Nilagiri district, in Tamil Nadu. 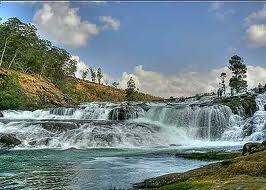 Initially ooty was captured by Todas, at the end of 18th century this area came under the reign of East India Company. This great southern dynasties and took the British to discover it in the early 1800's. Nowadays Ooty has emerged out as the most popular tourist spots of Tamil Nadu. Its pleasant weather, deep forests, deep and steep valleys, lush green landscape dotted with acres of coffee and tea gardens in both sides of the road attracts visitors. Botanical Garden, Government Museum, The Mudumulai Wildlife Sancturies, Doddabetta(it is the highest peak in the Nilagiri's [ 2623mts], 10 Kms from Ooty) , Kotagiri, Rose Garden, Art Gallery - Lalith kala Academy, Mini Garden, Stone House, St. Stephen's Church, Ooty Golf Course, Wax World and Tribal Museum, Ooty Mountain Railway, Ooty Lake. Coonoor (It is second largest hill station in the Nilagiri district), Dolphin's Nose(12 Kms from Coonoor), Ketti valley view point, Wenlock Downs, Mukurthi Peak & Mukurthi National Park(40km from Ooty ). Pykara, Avalanche. 1.Sullivan Court, 2. Hotel Sinclair, 3. Sterling Holiday Resort, 4. Hotel the Monarch. Tea & Tourism Festival Ooty January. Thaipoosam in Elk Hill Murugan Temple February. Ooty Mariamman Temple Festival April. Coonoor Mariamman Temple Festival April. Boat Races and Boat Pageantry in Ooty May. Flower Show in Ooty May. Fruit Show in Coonoor May. Flower and Fruit shows & dog shows are arranged during Summer Festival.